The Football Association of England is hopeful that a Great Britain men's and women's football team will be able to take part at the 2012 London Olympics. Britain do not currently enter a team, fearing it would damage the independent status of the English, Welsh, Scottish and Northern Ireland unions. But FA executive director David Davies hopes a solution can be found. "We will now look with urgency at how the home nations could take part in the football tournaments," said Davies. London defeated favourites Paris, as well as Madrid, New York and Moscow at the International Olympic Committee vote in Singapore on Wednesday. And Davies added: "Everyone at Soho Square would like to congratulate Lord Coe and all the other people, sporting and political involved. "It just goes to show that this country can achieve when all the parts support each other." But the Scottish Football Association has reiterated its opposition to a GB football team. A spokeswoman said: "Our footballing identity is Scottish. We have discussed the idea of a British Olympic team in the past and turned it down. There was no interest." Fifa president Sepp Blatter has expressed his delight at London's win. "I am a happy man because football in England is very popular, is played at the highest level possible and they have all the stadia," said Blatter. "It is a competition where the team must be called Great Britain, but how they configure it is their problem." 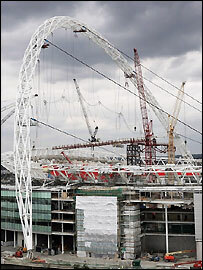 The finals of the football tournaments will be staged at the new Wembley, which is due to be completed in 2006.